Like many other Americans, by living room has been taken over by remote controls. Some I know how to use, and others I do not. It happens once per night that my husband asks, "Linds, have you seen the _____ remote?" It's not long 'til I'm bending over, digging in between couch cushions or looking under the shaggy rug for one of the remotes. Enter, the remote control pillow. It prefers to live indoors rather than outside. This was a design I hoped would curtail the nightly hunt for remote controls. Each one lives in its own diagonal pocket. 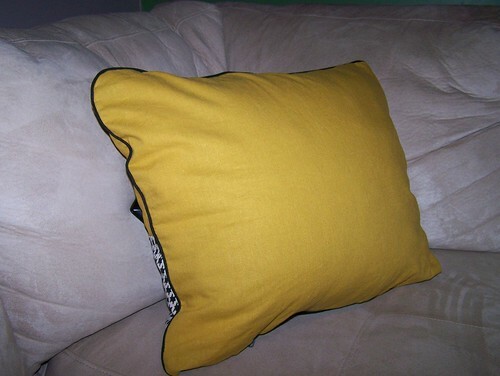 The pillow can be flipped around and used as a headrest. You don't even feel the remotes (or "clickers" as we called them growing up). I installed a zipper in the bottom and used Sew Mama Sew's piping tutorial for the black cord edging. 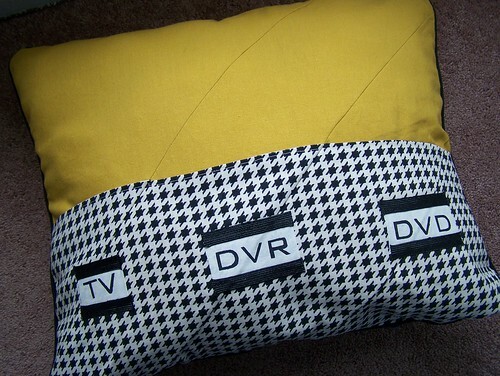 The fabrics I used are a canary linen lookalike and a houndstooth home dec print. For the lettering, I used freezer paper stencils and fabric paint. Apply the paint in a thin layer, and let dry. 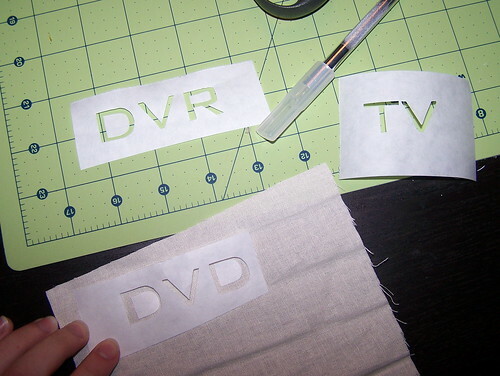 Peel off paper, and trim fabric words. Adhere to pillow front using Steam a Seam 2 and an iron. Cut ribbon strips and iron on to top and bottom of words, using Steam a Seam 2. Ta-da! My ultimate geeky home accessory, just in time for Oscars night. I'm linking up to amylouwho's Sew & Tell. P.S. 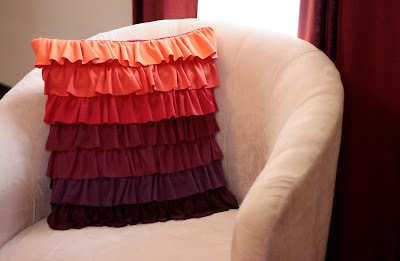 Please take a look at my friend Mary's ruffled pillow, which she's also entering in the Sew Mama Sew pillow contest. It's fantastic! now for a tutorial on training kids to put them in the pillow? best idea EVERRR. go you! so cute. Very cool idea. 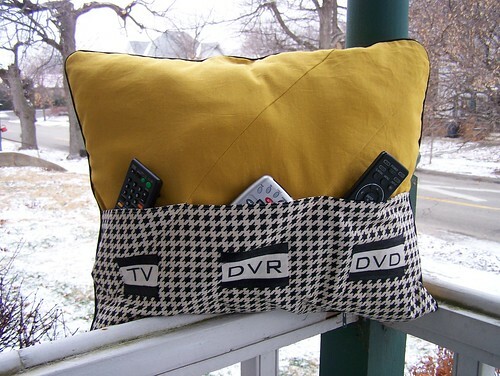 A tastefull way to keep the remotes handy. Love it! What a great idea! 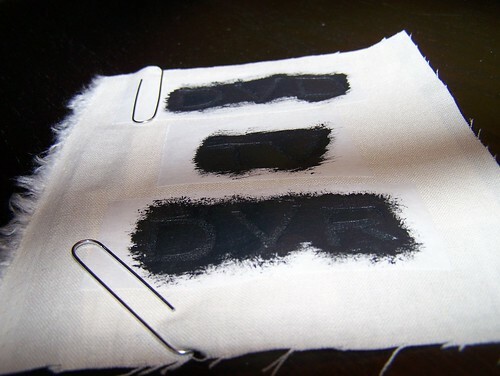 Love how easy it looks to make the stencils, too. That's a great idea! Do they get put back in the pillow? That would be the problem at our house. Remotes need their own locator beacon or somethig. cute idea. i hope it works! Brilliant! Even my husband will love this! Oh my gosh! I need to make this for my grandparents...it's perfect! Thanks for sharing, it's on my to-do list! 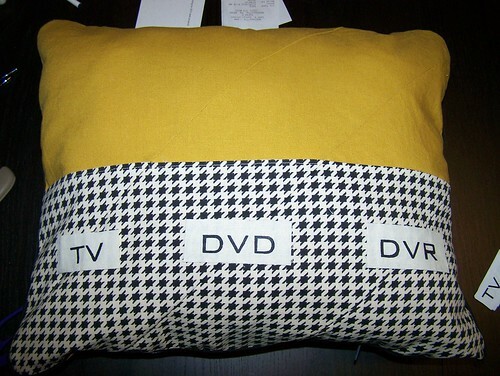 Love the concept of the pillow. Very creative! 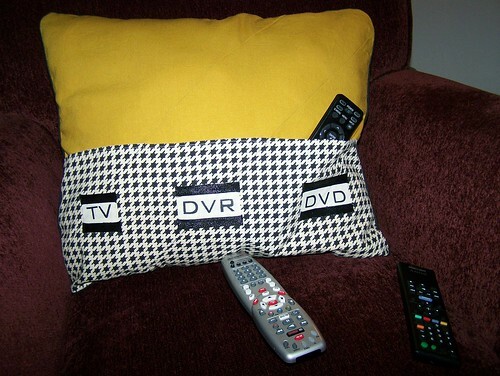 Not sure my husband could manage to lift his head off the pillow and replace the remote...lol! Awesome idea!! Thanks for auditioning for OMTWI! Don't forget to put the button in your post or sidebar!